Both groups and entries have a new SSO dialog that can be accessed from the Folder Actions or menu, respectively. or any other text that has a valid email format. When possible, try to choose placeholders that are six characters or longer to avoid spurious matches. When the Inherit checkbox is used, the username placeholder is set automatically from that of the parent group, and is displayed on the dialog as non-editable. Password: the placeholder to use in the password field of a website. By default, this is set to placeholdpass% and can be changed if needed. When possible, try to choose placeholders that are six characters or longer to avoid spurious matches. When the Inherit checkbox is used, the password placeholder is set automatically from that of the parent group and is displayed on the dialog as non-editable. Redirect Early URLs: a list of URLs (i.e. website addresses), separated by spaces or on separate lines, for which the SSO server should authenticate earlier than usual. 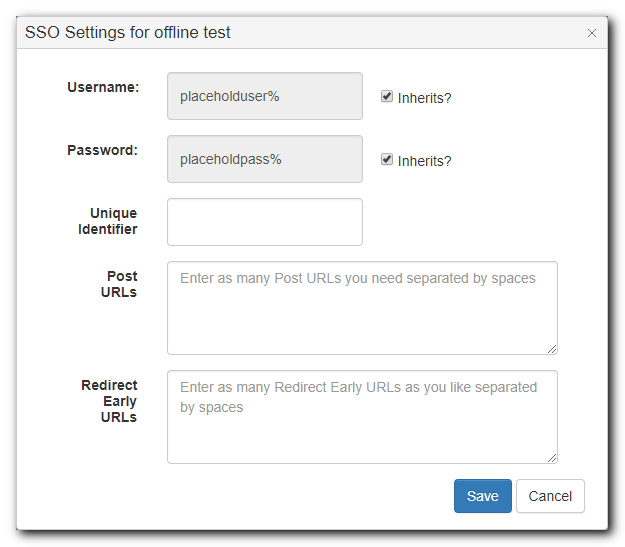 This setting is mainly for certain websites on which the SSO login does not work properly even when the Post URLs are specified, and can be left blank for most entries.